At present, my thinking is that the boxes will provide their own lighting in the exhibition space without additional spots in the surrounding space. The ambient lighting will not be completely dark but will not be bright. Normal LEDs are too dim so I am mainly using superbrights. These are generally rated at around 3.0V. If I use a 9V supply, I can power 2. Three LEDs would need a 12V supply. One advantage of LEDs is the choice of colours. 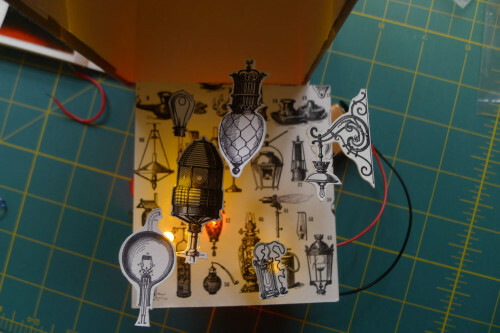 There are things to be worked out in the physical lay-out of each box. Here, the red blood cell on the left is lit with a diffused 10mm LED and the right white blood cell is lit with a superbright 5mm red LED. 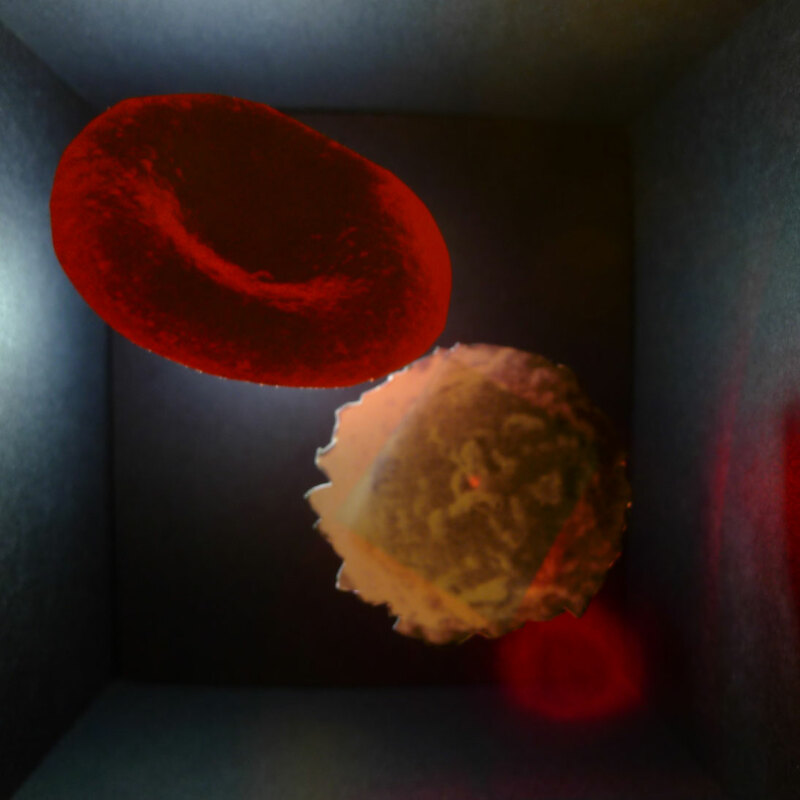 There is a mirror attached to the back of white blood cell which reflects the LED light back (the red spot in the far back corner of the box). The light of normal LEDs point forward and I experimented with mirrors to reflect the light to the general surrounding area. The mirror in the case cast an undesirable shadow on the cut-out. 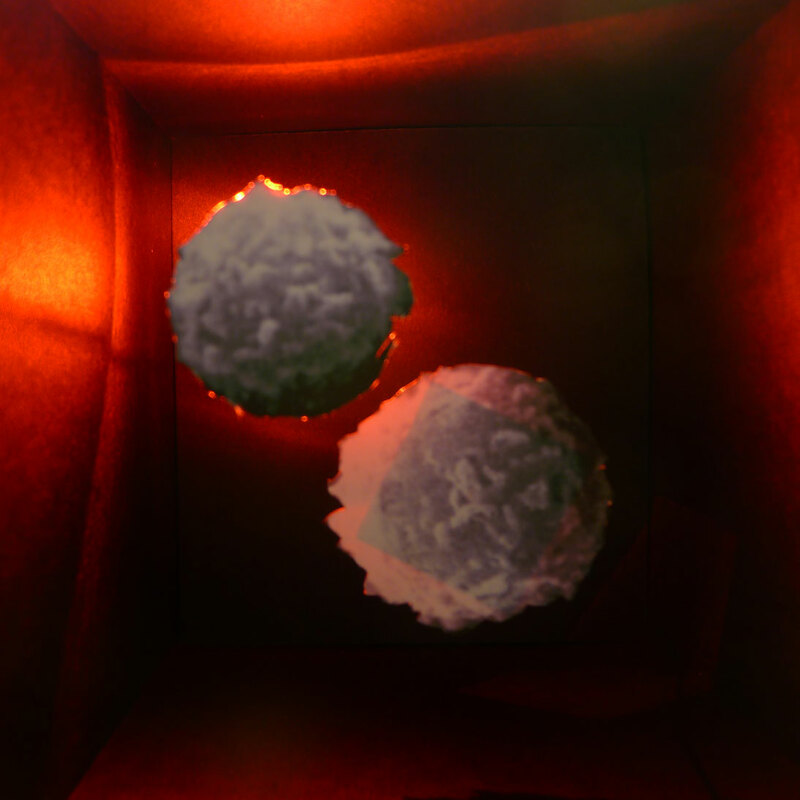 Here, the smaller white blood cell on the left is backed with aluminium foil, not only does it reflect the light of the superbright red LED back to the surrounding space, it also blocks light coming through the paper. 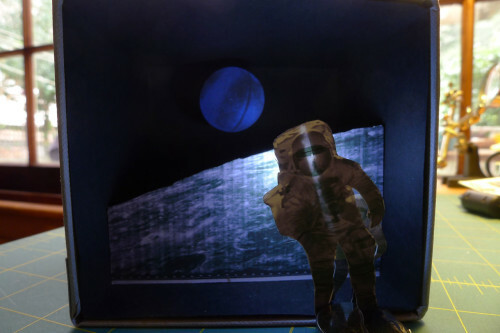 In this mock up, the astronaut is backed with aluminium foil. A diffused white LED is taped to the back of the astronaut and angled towards the moonscape behind. (A strip of the al foil had to be removed in the middle of the astronaut to prevent the LED from shorting, creating a bright line.) Another normal superbright white LED is behind the moonscape, lighting the earth. A small mirror is placed behind the moonscape to reflect the LED’s light. In some cases, the light will shows through the paper (300gsm) like they do here. I am powering 2 superbright yellow 5mm LEDs plus 1 normal red 3mm LED on a 9V battery and another superbright yellow on a 3V coin battery. For the working model, I would put them all on 1 circuit and power with a 12V supply. 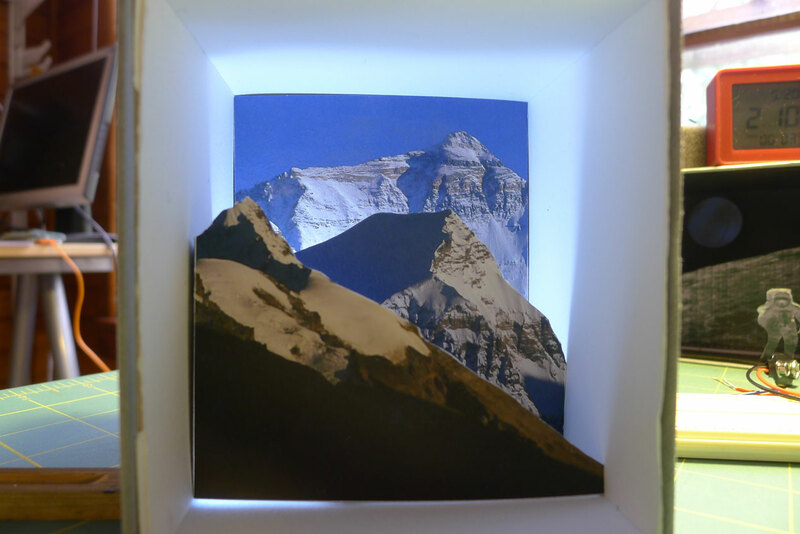 The yellow LEDs are positioned through holes in the backing paper/ the background but the red LED is positioned behind the paper. This is using 2 superbright white LED to light behind the image printed on a piece of translucent paper (special ink-jet printable ‘tracing’ paper 135gsm). 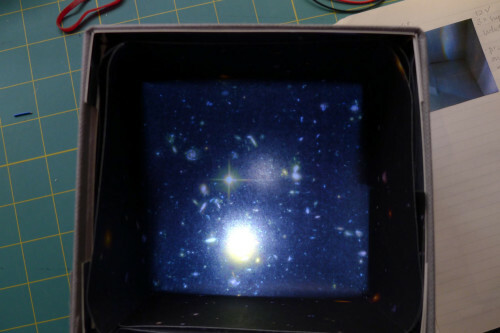 This is the same set-up except it was using 1 diffused white 10mm LED, which gives no hot spots. 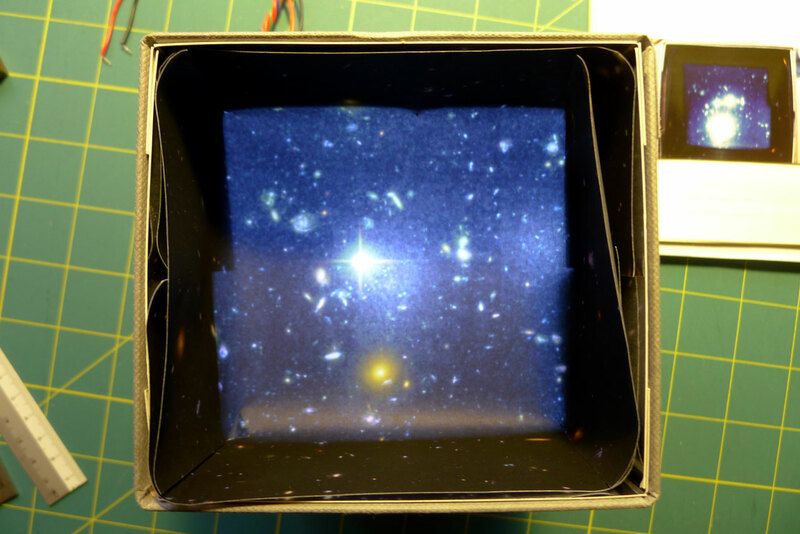 This is a mock-up which I am not using, but it shows how bright 2 diffused white 10mm LEDs in a white box can be.